This is not Quasimodo ringing the bells. This is no conclave of hooded celibate monks pulling ropes while they chant out their change ringing. Here is a woman slamming levers on a contraption of steel cables and wood. “Time to call people to church,” she says and begins pounding out a series of hymns familiar to any American church-goer, a reminder that it is Sunday morning and people are gathering for worship. It is an audible sign the church is alive and God is to be praised with the sound of voice, organ, and, yes, clanging metal. 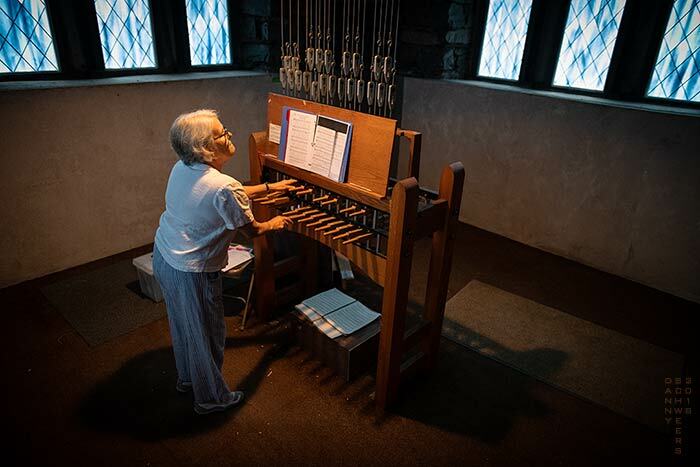 Photo of a bell ringer at Westminster Presbyterian Church, Wilmington, Delaware. Great to see our church as one of your featured photos, Danny! Thanks! Great pic! So happy to have you in worship & various places where we are all making WPC [Westminster Presbyterian Church in Wilmington, Delaware] a welcoming church! Thankful for the recognition of the woman who calls our church to worship. What a gift are you each in your own unique way! This is so cool. Didn’t know what it looked like. More precious – the dedication of the bell ringer to wake us up to God’s call.